For those wondering, yes, Volume H is a raid 6 volume. No, it is not best practive to store that many drives that may be used concurrently on the same volume as it can be a nightmare from an IOPS perspective. My only goal was to test 32 drives in the WHS so I let it be. The results on both old and new WHS boxes were the same, SCARY! The quick summary is if you have the need to run over 64TiB today, build a second WHS or something! Here is a quick summary of what happened when I installed over 32 disks on both the physical and virtualized WHS machines. 37 disks in a WHS (10 Physical 27 VHD) yielded an error. That is not something you want to see, ever, on a WHS that has data on it. I have backups, but copying TB’s of data is not fun. Bottom line: I won’t be experimenting with more than 32 drives again anytime soon, or at least until WHS V2/ Vail comes around. It seems like the current version of WHS does not like that many drives. Has anyone else tried over 32 drives in a WHS? 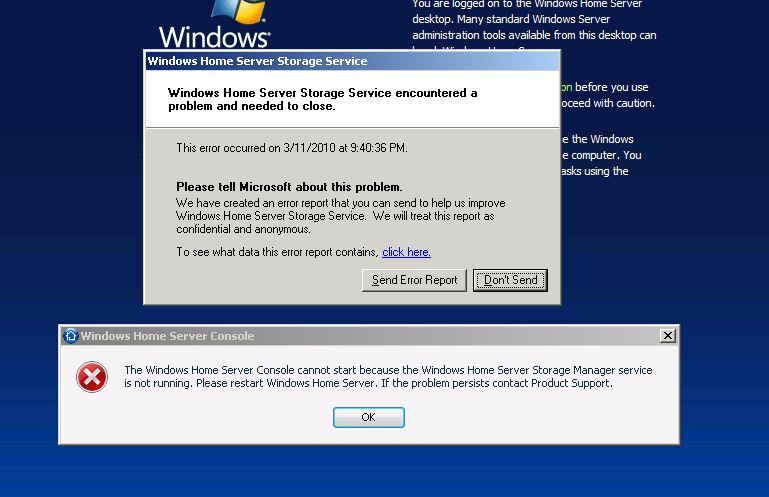 If so, does anyone have workarounds for the errors encoutnered above? I have fourteen scsi hard drives in a powervault 210 connected to a scsi card in a poweredge 500sc. 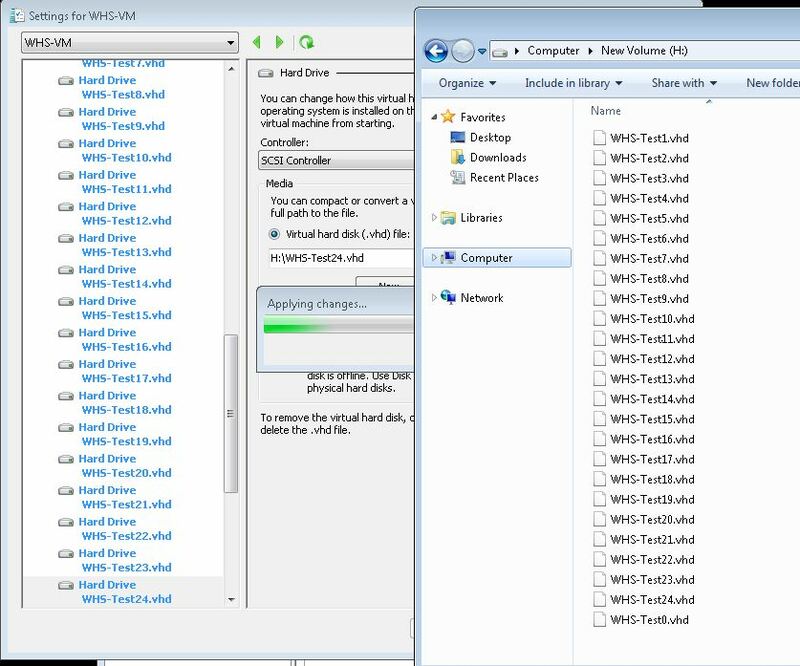 If I had used raid 5 would that only count as 1 drive for WHS? I think yes. Meanwhile the fourteen individual hard drives (some 73gb, some 37gb) are doing just nicely. I guess I had better find another powervault 210 or 220 and add another 14 drives, and then find another way to add four or more and break it! Or not. @Corey: This will be less and less so I’m guessing in the future. HD Video takes up so much space that between Tivo (and similar) applications, downloaded content, downloaded installation packages, backups of multiple systems, and etc, a greater percentage (and we may be talking 1%) could use TB’s of storage. Using cheap 500GB or 1TB disks would only yield 8TB or 16TB of storage once duplication is taken into account. Sure that’s a lot, but smaller SSD’s in PC’s with huge amounts of network storage is a nice computing model these days. @Bob: Yes WHS sees this as one drive. For example a 2TB MBR volume that is a raid 6 array with 4x 1TB drives passed to the WHS will show up as one drive to the OS. The old WHS used an Adaptec 31605 with 1.5TB drives so I’ve certainly seen this real-world. Thanks for testing this and satisfying curiosity! Yeah, seems you’d be force to coalesce drives into 2 TiB volumes, as WHS doesn’t support GPT disks (at least without some fuzzy hacking that would make me very uncomfortable… like finding out your life support machine is running beta firmware). But you’d still have a 64 TiB limit (62 TiB of storage, since the system drive counts too). 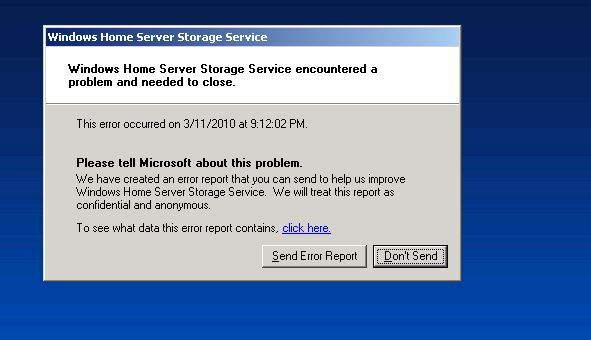 At least by the time I’m sure WHS v2 (aka Vail) will be out before I get anywhere near having that much storage available. You can actually hit 64TB not just 64TiB. The reason for this is that you can run an underlying Raid 5/6 array then pass 2TB (not TiB) volumes into the OS. It turns out 1.5TiB drives actually get you closer to 4x 2TB MBR volumes than 2TiB drives (which are about 1.83TB to the OS) when used in raid 5/6. I think that Vail + GPT would be great! It will be needed just from the newer, larger drives hitting this year. There’s a newer hack that allows GPT volumes in WHS v1 – it works with PP3, unlike the original GPT hack. It’s also more detailed, and frankly, that makes me feel *more* comfortable with it. Essentially you add the GPT volume to WHS, let it repartition and add its 2TB MBR volume, record the storage volume info stored in the registry, stop WHS, repartition the drive as GPT again, then “patch it in” to the storage volume info in the registry. I’ve done this successfully for my two Drobos (16TB thin provisioned, 5.5TB physical) and it has been running well so far. I also saw a very large performance increase from WHS not simultaneously accessing multiple virtual volumes on the same physical unit.